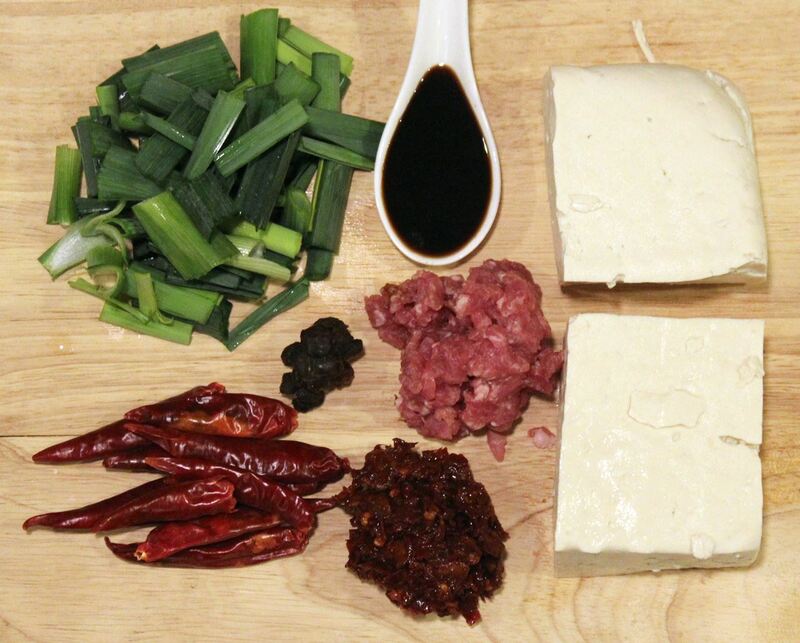 This authentic Mapo tofu recipe is relatively standard, recommended by several food service organizations in Sichuan. It is versatile, delicious and surprisingly easy to make. Indispensable ingredients include Pixian doubanjiang, ground beef and Sichuan pepper powder. The actual dish can be characterized by eight specific Chinese adjectives: numbing, spicy, hot in temperature, savory, tender, aromatic, flaky and lively. The flaky mouthfeel is from the ground beef, while the lively looking comes out of the bright oily color, tender tofu cubes and green garlic leaves. 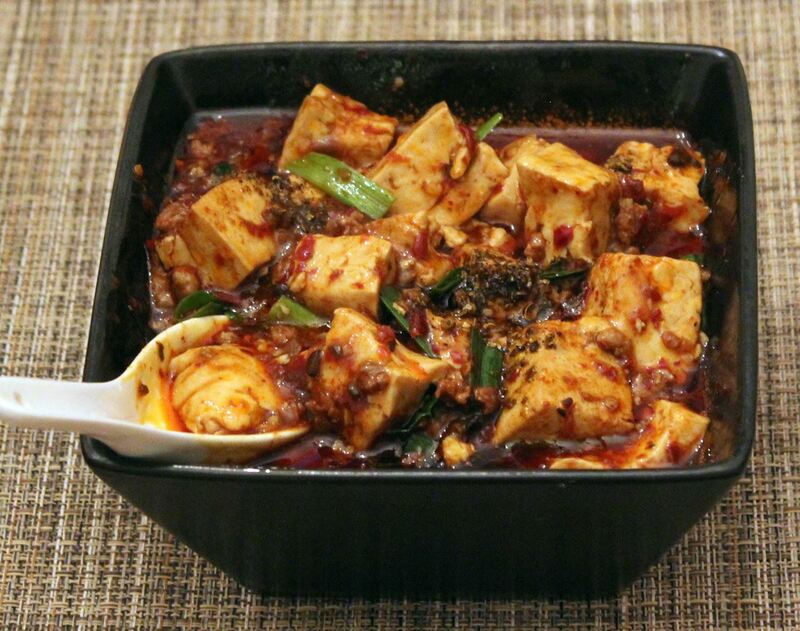 Mapo tofu is served in hot with the mala flavor of Sichuan cuisine. 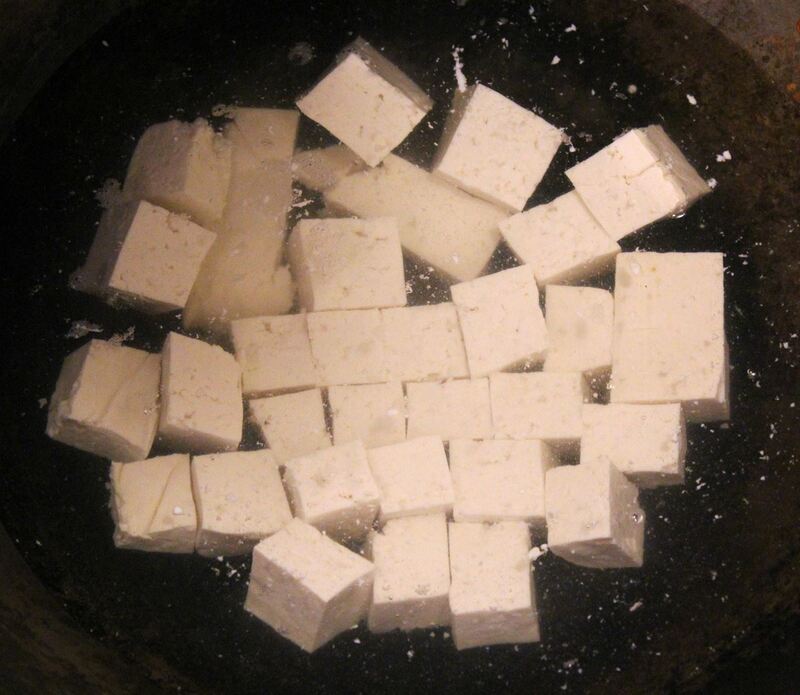 2Cut tofu into cubes, boil them over medium heat with enough water and one teaspoon of salt for 1 minute after boiling. Drain tofu out and set aside. 3Heat oil in wok over medium heat. 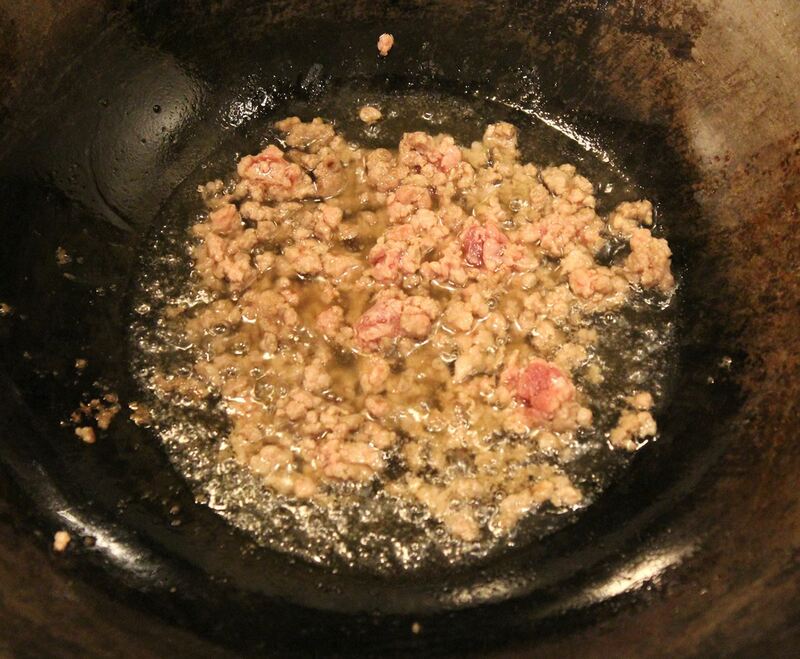 Add ground beef, stirring constantly until the beef becomes flaky. 4Add minced Pixian doubanjiang, minced douchi and chili powder. Stir over medium-low heat until fragrant. 5Carefully add tofu, cooking soup and soy sauce, and bring to a boil. Try to avoid smashing tofu. Cook over medium-low heat for about 5 minutes, that is, "du" for 5 minutes in Sichuanese dialect. 6Mix starch into 2 tablespoon water. Drizzle in equally in three times and stir (push) tofu slowly and lightly each time. Add green garlic and MSG right before the last step of thickening. 7Transfer immediately to a serving, heat-retaining bowl and sprinkle with Sichuan pepper powder. Serve in hot with rice or bread. 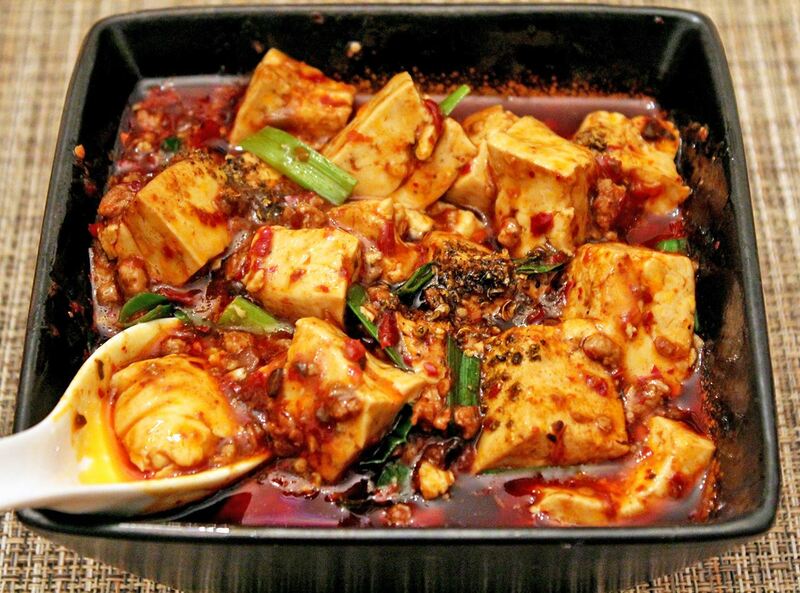 Mapo tofu is called Mapo doufu 麻婆豆腐 in Sichuan. Tofu can be of firm, soft or silken tofu. Some firm tofu has an astringent taste, such as the ones from Korean stores in the Northeastern markets in the United States, while soft and silken tofu are easy to fall parts. Step 1 of boiling with salty water (for 400g tofu, use 1000g water with 20g salt) can reduce or remove the possible astringent taste, and make soft and silken tofu stronger. For tofu which has strong astringency, a small amount of Sichuan-style pickled mustard green (20g per 400g tofu) in salty water may effectively neutralize the astringency. If tofu is boiled too long, however, it will become spongy and loose its soft tenderness. The firm tofu in Sichuan usually does not have the astringent taste (actually having a sweet note) and thus does not need to be prepared with Step 1. A similar one available in the Northeastern market is Chang Shing firm tofu shown below. Ground beef should be stir-fried over medium heat slowly until its oil just comes out. It should not be overcooked though (The best is that the beef has about 15% water left). Beef can be substituted with pork, but the mouthfeel is less flaky. Pixian doubanjiang needs to be minced well. The reddish color of the final dish comes from both doubanjiang and chili pepper powder. Chili pepper powder should not be too spicy to overwhelm main flavors. The Sichuan chili peppers or Sichuan chili powder is recommended. Korean chili powder is a substitute. Yongchuan douchi, or Yongchuan fermented black beans is most popularly used to enhance the flavor in Sichuan. If spiciness is not expected, Pixian doubanjiang should be replaced with a non-spicy doubanjiang ( see the general guide to doubanjiang to choose a right one) and chili pepper is omitted. Cooking soup is an all-purpose soup which is usually boiled from miscellaneous bones. It can be replaced with supermarket canned chicken stock, or just replaced with plain tap water. Step 5 of thickening is critical for soft and silken tofu to be attached with flavoring sauce because unlike firm tofu, soft and silken tofu have much less capacity of absorbing the braising sauce. Thickening is separated into multiple steps such that the water inside tofu has a chance to come out and gets dry during thickening. 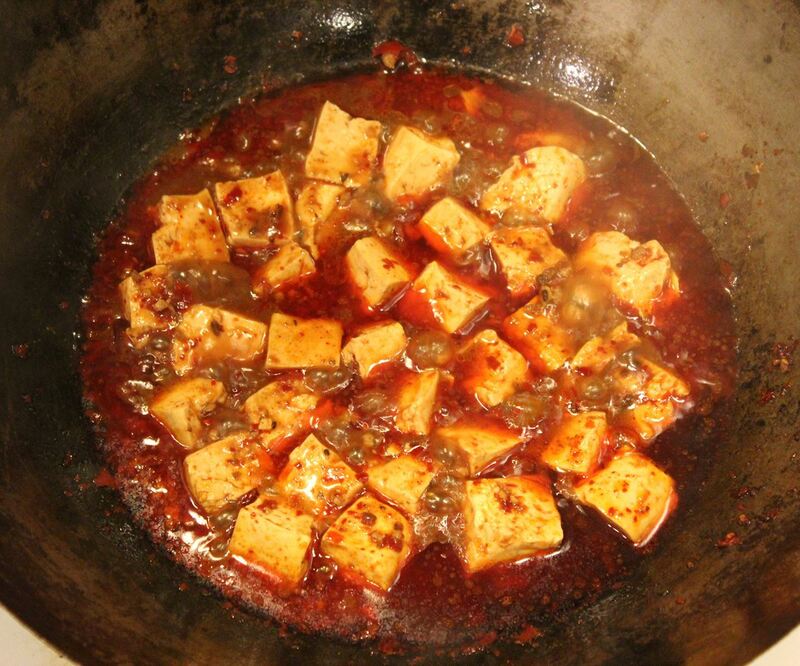 Home cooks in Sichuan popularly use firm tofu instead of soft or silken tofu, and rarely take Step 1 and Step 5. If green garlic is substituted with minced garlic cloves, the minced garlic is added at Step 3, stir-fried along with doubanjiang. 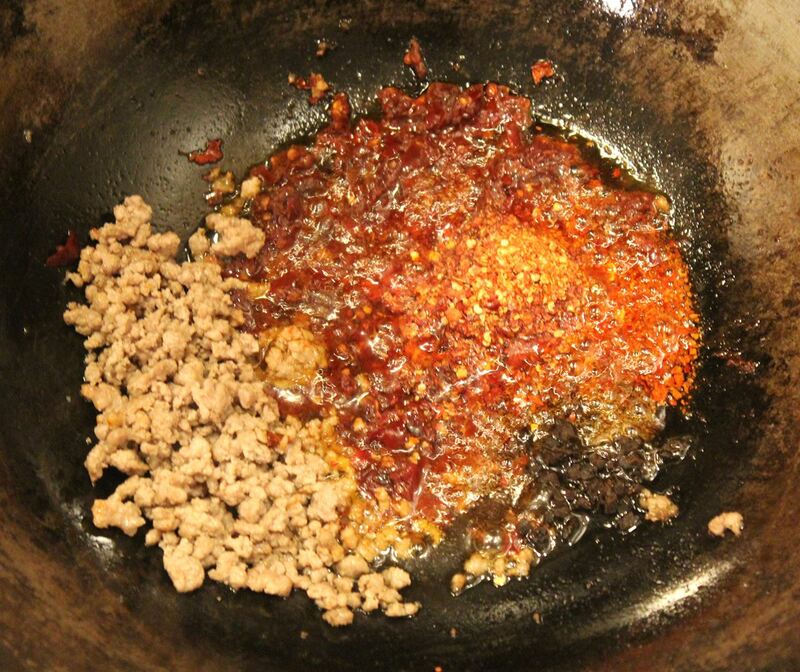 Adjust the amount of chili pepper powder and Sichuan pepper for different preferences. For vegetarian, the meat is either omitted or substituted with minced mushroom. Mapo tofu is too popular in the world to trace back to the original recipe, but cooks like you always want to know how authentic the dish under cooking is. A book written by Che Fu, a senior native Sichuanese journalist who lived in Chengdu for over 40 years, described how Mapo doufu was made in 1920s - 1950s by a key chef of the original Chen Mapo restaurant where Mapo tufu was initially created. The book has won very high historical reputation in cooking communities of Sichuan. The Mapo Doufu chapter detailed the ingredients and step-by-step breakdown of the cooking process. Ingredients: drop soy sauce and thickening starch in this recipe. Cooking steps: drop Step 1 of boiling tofu in this recipe. Instead, cut tofu directly into the wok. Drop Step 5 of thickening. Actually, home cooks rarely use thickening starch. In the Northeast of United States, the best tofu for the classical recipe is Chang Shing firm tofu, whose texture is close to the tofu in Chengdu.